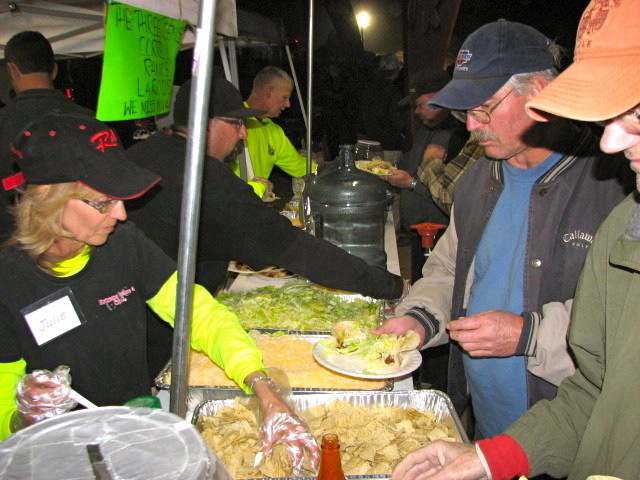 For the fourth year in a row, Raceline Wheels has hosted the Volunteer and Raceline Drivers Taco dinner at their very impressive booth right in the middle of Hammertown. “We handed out over 2,00 tacos to volunteers. We appreciate everyone that helps put on an event as enormous as KOH,” said Mulkey at the Volunteer Raffle as he threw out boxes of hats. At this year’s King of the Hammers, Raceline Wheels announced a $5,000 bounty for a Raceline Wheels user to win the Ultra4 race on Friday or a $1,000 bounty for either the Stock or Modified Class winners using any Raceline or Allied wheel. “We are very excited to give Matt Peterson, the ONLY finisher of the Every Man Challenge Stock Class, a check for $1,000 for crossing the finish line on Raceline Wheels!” said Mulkey. Matt Peterson has been an avid supporter of Raceline Wheels for years, both on his vehicles and as part of his business Rock Ware Motorsports. Also on the list of activities for the 2013 King of the Hammers was the first ever Checker Flag Party on Friday night. Unfortunately, the band was turned around on the Cajon Pass due to snow. 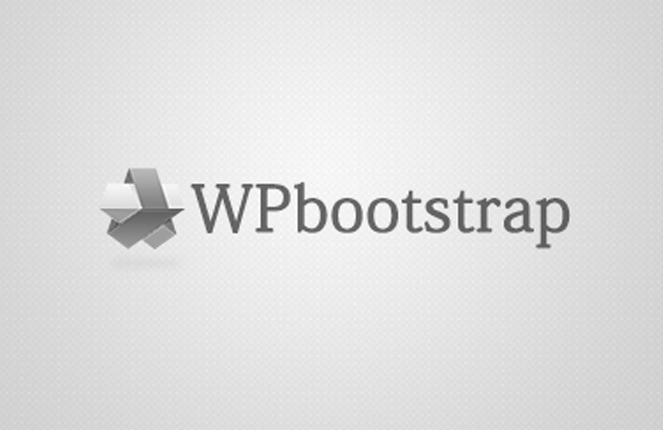 “It is a great idea, and we will do it again, but sometimes things work out for a reason. It was so cold at the finish line on Friday night very few would have enjoyed the band. Next year we will order up better weather,” laughed Mulkey. The real story is Raceline Motorsports Manager Greg Mulkey taking the green flag in his first ever race! With minimal time to put the race rig together, the team at Teraflex Suspension and Raceline Wheels did a fine job streamlining performance while keeping a stock look. It was only the night before the Smittybilt Every Man Challenge race when Mulkey was able to take it out for the first test, which brought nothing but a smile to his and co-driver Bart Dixon’s face. “Just the hype around being at the starting line of the race was experience enough for me,” said Greg Mulkey. “We broke a shock 30ish miles into the 10foot whoop section, but we kept going in and out of these huge holes. When we got to the sand hill we used the WARN Winch and helped pull a couple of UTV’s off and a couple of stock cars off, enough to clear a path that gave me a hole shot from the bottom. I just hit it and had everyone running like squirrels everywhere! When I finally got stopped, I looked over at the rock nearest me and there was Shannon Campbell giving me a thumbs up saying, ‘Go Mulkey!’ with a huge smile on his face.” They made it to the main pit where the Dust Junkies welded up the shocks and they were back to race status. They got to Aftershock and in a patch of rocks taller than jeeps with vehicles high centered, bound up everywhere and winch ropes going in every direction, Bart Dixon told Mulkey they were going to take the alternate route right up the side of the hill. “I could hear the whole canyon echo with excitement as they heard what we were going to try, and sure enough, Bart led me right where I needed to go and we passed all of them,” said Mulkey. When they got to the bottom of Chocolate Thunder they called it a race and drove back to camp under their own power and ready to trail wheel at Tierra Del Sol. The White Jeep JK will be on display at Tierra Del Sol and Moab Easter Jeep Safari among other events this year. Only a new right rear lens will be changed between now and March 2nd. 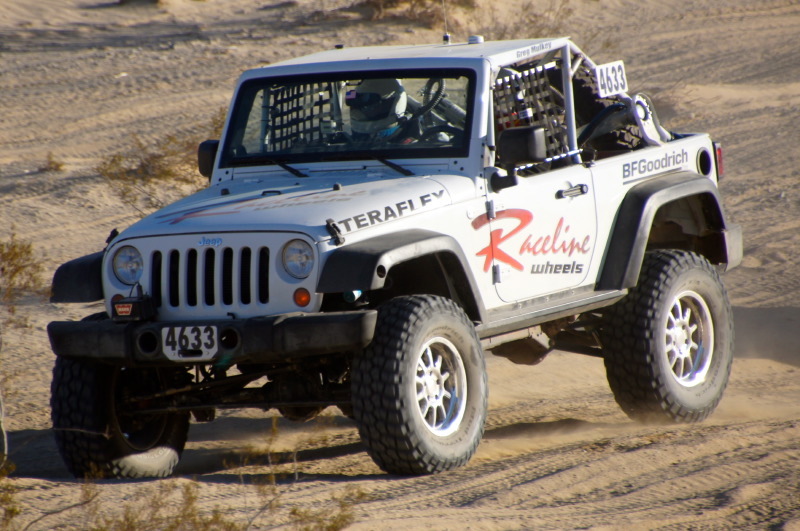 Be sure to stop by the Tierra Del Sol booth for the Customer Appreciation taco dinner and band on Friday night, and look over the Jeep that is boasting KM2 BFGoodrich Tires mounted on the new Raceline Liberator Wheels with Staun equipped beadlocks. A brand new R&D suspension system of the current pre-runner suspension design by Teraflex with King 2.5 Shocks, now proven to boost 12” of travel in the front, 15” of travel in the rear and 9” of up travel in both the front and the rear. “It was a smooth ride!” said Mulkey. For more information on any of these programs or upcoming events please go to www.facebook.com/racelinewheels.